We are still treading water and waiting for her immune system. Phoebe’s neutrophil # was down this morning, but they said that is to be expected as her immune system tries to “re-boot”. The ANC (Advanced Neutrophil Count) # will fluctuate up and down a bit until it eventually starts doubling and tripling in the next few days. Her monocyte # was higher today which is great because monocytes are baby neutrophils. Today a monocyte, tomorrow a neutrophil! Hey, that’s another good t-shirt idea. 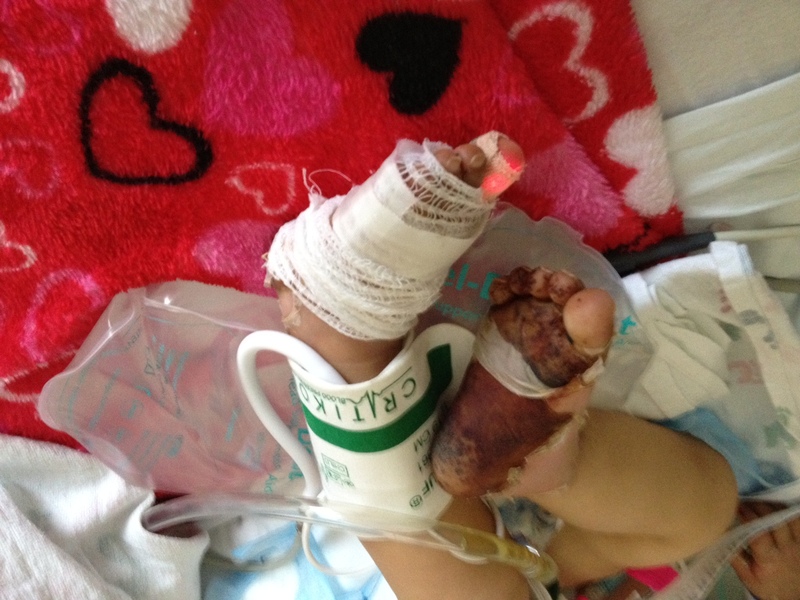 Phoebe’s hands and feet are still extremely swollen and hot, black and blue and weeping fluid as the sores open up. She has Methotrexate toxicity, which means that the drug they inject into her spinal fluid burned her hands and feet from the inside out. It is also likely the reason that Phoebe was so somnolent and “out of it” the week after she received the Methotrexate injection. I am praying that she is awake and REALLY awake when she is weaned from sedation. Her chemo is delayed obviously and there will be discussion about the removal of this drug from her plan. Our oncologist has never seen this type of poisoning and his fellow oncologist who has been doing this for 25 years has only seen it once. It is EXTREMELY rare. Leave it to Phoebe to be unique yet again. She appears to be a little less swollen today in her arms and legs and they have upped her dosage for the Lasix drug that helps remove water from her body. The Lasix can only do so much until the water in her body cavities is drawn back into her vascular system and that can only happen with her immune system doing it’s job. Yesterday they started back her ng tube feeds at a very tiny amount and will try to increase it little by little so that they can increase her calories and hopefully take her off the TPN IV nutrition. Please pray this goes well, it usually takes some time for the stomach to adjust to food after it has been a while and it often causes her pain. They are also starting laxatives, so I’m nervous about her tummy cramping up and her being uncomfortable without the real ability to communicate that to us. Her lungs are very smushed up in her chest right now because her abdomen is so full of fluid and it is making it hard for her to breath deeply like she needs to in order to keep her lungs healthy. She can’t come out of sedation and off the breathing tube until she can breathe well on her own. The fluid just needs to go. Period. The immune system needs to get on the job. I am wondering if Phoebe just doesn’t need the spinal/intrathecal chemotherapy injections and if maybe this is God’s way of showing us that. She is supposed to have an Omaya port surgically placed in her head for her to receive Methotrexate directly to her brain. That now seems totally out of the question in my opinion and had this not occurred with her hands and feet we would have gone ahead with it, possibly doing permanent damage. I believe that God will guide us each step of the way and make known to us how we are to proceed and what changes need to be made. And, if at any time we feel led to change Phoebe’s treatment plan, we will do that. Quitting chemo altogether is not an option. We actually discussed with the Oncologists prior to Phoebe’s treatment a hypothetical situation, we asked them “What would you do if we said that we believe Phoebe is healed now since her tumor is gone and we just want to take her home and not do chemo?” They told us that they would take it to court. If she had a %10 percent chance of survival, then they would let us take her home, but because her protocol has a %50 success rate in the treatment of her cancer, they would take it to court. Now, this was a friendly conversation, because we were not indeed planning on skipping chemo, we were just curious what they did when such situations arose. We could of course move her treatment to another hospital etc. and make changes to her plan, but the cancer will be treated one way or another. Because of this, I believe that if God desires to heal her instantaneously, He will make obvious to the doctors and to us that she is healed and we will see a miracle unfold. He will not “keep us in the dark” and putting her through chemo needlessly. I address this here, because I have received several very concerned (and rightly so) and loving e-mails about discontinuing chemo the past few days. I understand your thoughts completely. It is horrible to watch my little girl suffer like this, but now maybe you have a better understanding of our situation. Please continue to pray for Phoebe to pull out of this. Never have I physically hurt for one of my children like this..it is overwhelming. The boys are doing well and many people are reaching out to us and to them. We have truly been taken care of. Thank you to all of you who have sent blankets and prayer shawls and care packages and kind cards and e-mails. You bless us! I just wanted to respond to the post suggesting that Phoebe needed a blood transfusion and diuretics days ago, and say that she has been receiving both for several days. Thank you for the advice. I try to be as detailed as possible in my posts, but inevitably, I leave out certain details. Phoebe has continued to swell in spite of the diuretics and has received several transfusions as is usual when she is neutropenic.